Okay, about time I revealed to you guys that I'm not dead and nor am I wasting my summer not doing any building. I'll have you know between decoration, partying and work, I've been very busy modelling, just not modelling on a computer for once! This 'ere, is an old Epic Leviathan, courtesy of the Imperial Guard. Several people have now built one, though back when I started (I kinda took a 30 month sabbatical from it!) nobody had done such a thing. There I was thinking, muha hah haaa... They'd probably say this is impossible but meh, I'll go ape and make one. I'd seen bigger models, but I wanted big -and- detailed. Okay, for those of you true fans who remember the old beast, I must admit one thing to you. 4 years ago you couldn't find a picture of this thing anywhere. I remembered what it looked like, but in terms of scale, I couldn't remember. The most important thing to top that caveat off with, is the fact that I didn't want to just recreate the model. No, not me, I wanted to REIMAGINE it! So, This is what I think the Leviathan -should- have looked like... And the additional features of my tank shall be revealed as we go! So, to honour the Royal Volpone, I decided to make the Leviathan the same scheme, to act as their command vehicle. If you object to the difference in normal from design, then call this a Volpone Pattern Leviathan. I'm not gonna bore you with the abandoned attempt, I'm gonna go straight into the second version of the track sections. How's this for a start? a leviathan in 40k scale, that's a very good idea! wonderful! would you mind saying what the parts are that you are using on it? Oh dude! Sweet stuff. I've seen many a 40K leviathan on 40K scale and most of them make them waaaaaay too large. Your proportions seem to be much, much better. Even those basic track shapes look amazing already. @ Meph - Thanks dude. This will actually end up bigger than the original scale, but yeah, as I said I wanted to reimagine it and adapt the design. The 'Volpone Pattern' Leviathan is probably closer to GW art, than the games, where you tend to find these massive cathedrals on wheels in the background! Colonel gravis has made the most accurate and true-to-scale and design version of the Leviathan, and I can post a link up if you haven't seen his amazing work. And here we see one of the initial differences with the Volpone pattern Leviathan. Now I believe the original Leviathan was supposed to carry command squads or something. Seeing as Command platoons are never far from dozens of troops, and also thinking maybe nistead of an HQ unit, you would expect and HQ unit and 2 troop choices along, I figured the Leviathan didn't need to just ferry a couple of men around. It also needed to ferry armour. So, this pattern is designed to take 4 normal sized tanks based on either Chimera or Leman Russ chassis. Alternatively, you can fit one superheavy tank in there, though fluffing properly I would expect the Leviathan would carry some chimeras and perhaps Salamander Command/scout vehicles. Oooh meph, forgot to mention, thanks about the track sections. These were actually the second design, but were made to look (hopefully) a lot more in keeping with Chimera/Leman Russ style track sections, only on a huge scale. Here's a tip for those of you wishing to make a gun platofmr, but not wishing to come up with smoe homemade rotation mechanism. I call it cheaticus Compact Diskus. This is the first major difference between the Volpone pattern Leviathan and the Epic one. The mega sized 'doomsday' cannon on the front has been replaced with something smaller, since anyone with a 3 inch wide gun on their model needs a place to store 3" wide ammunition... Mine can carry more ammo cos it's smaller (yet still really big) - but yeah, no fixed wall mounted gun. I have a balcony with a really big mortar on it! While the tank bay is intended to hold, duh, tanks, the intent is also to literally fill this tank with infantry. Infantry will be all over the outside of the model, but also will enjoy riding indoors.. Here's the first gantry. While the gantry is 10cm off the deck (I missed a trick not using IMPERIAL measurements, tee hee!) it still only clings to the edges of the bay, and the main reason for that is to fit a rather large superheavy in. I've seen something like this done once before, but I'm looking forward to seeing this version. Big things please my small mind! You can also find another one in Bell Of Lost Souls' lords of battle codex... BoLS also boasts a CAPITOL IMPERIALIS... which is a bit bigger than my Leviathan. And more crazy... .. As far as I know, no gantries inside, but does double as a carrying case... and coffee table. And had to start painting some detail, since once this thing is assembled, painting inside is going to be a mite tricky! wow... looks very, very nice! Thanks Mr K. for that, you can have another update. Interesting. Nice idea with the CD tray. Don't get me wrong, I'm very happy the Nazi's were on the losing side of WWII, but you have to admit some of the stuff they were coming up with towards the end of the war was damn impressive, albeit probably unweildy and impractical. But anyway, that is some pretty fast progress. Keep it up and we'll see it finished pretty soon. Actually, is it just me or is this considerably bigger than all the other scratch-built leviathans out there? Well, technically I'm cheating speedwise. I've done a lot more than this, I just wanted to bring you guys up to speed with seeing how she got to where she is. I suppose you could accuse me of working on this model for three years. Soon as Cities of Death came out, I made a start... then I took, kind of a three year break after doing the basic track modules. Where I started again with the Cd tray, the sides, the heavy bolter sponsons, and onwards all started again about 6-8 weeks ago I guess, but I've started to pick up the pace on my work on it. I've been told to bring it to Warhammer world as an objective in the Horus Heresy Campaign weekend (September - warhammer world) so I've got a tight deadline! .. but yeah, I'm working full time evenings on weekdays doing this at the moment. The Capitol Imperialis is supposed to be able to hold 30 tanks. My version of that would actually fit 30 guard tanks... and I'd buy another 25 guard tanks just to prove it... I'm sick. 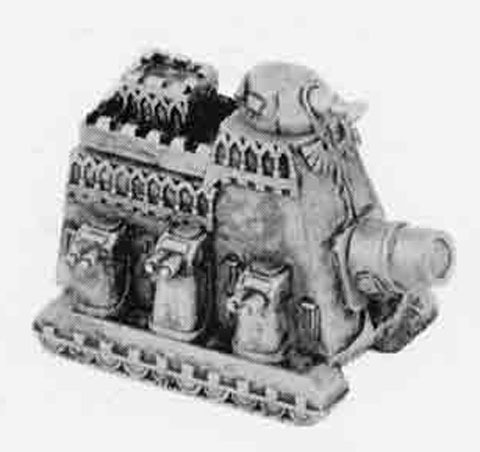 Oh meph, sorry, didn't read your bit about the main gun.. Yeah, I get me a fair bit of flak for dropping the doomsday cannon, but I did say a PVC pipe can fit on the front of my tank, but I'll only be able to store two rounds in the tank... So the Doomsday Mortar is much smaller, but still slightly larger barrel-diameter wise than any tank on the baneblade, so enough to dish out some hefty templates. Going back to the point about showing some of the back catalogue of pictures also means you are missing a lot of pics, but then I'm trying to select the interesting ones for you. This one is to prove, once I'd finally built the command module, that I could remove the command module from it's emplacement. The whole kit comes apart (deliberately!) into 7 distinct 'modules' not only so it's easier to transport but also so you get a chance to see inside! So there I've taken the command module off and nothing blew up. Oh, and anyone doubting my dedication to the project: Last night I rebuilt the entire port side track module, applied rivets to the sponson sections, glued the sponson sections to the primary hull and rebuilt the dozer mount (Why do you think there's gaps on the front balcony? ) ... I will sleep next year. wow... that's really a leviathan! wonderful!!! Cheers Mr K, I hope you enjoy watching her develop. I had a quick check now I'm at my home Pc and I believe I have taken you guys to about 20th July, so you're only a couple of weeks behind real time. I have over 100 photos of this thing being built and I doubt you wanted to watch them all, so enjoy the short version. Amongst other things, by this point I also decided to throw in some Necromunda plastics! So the big one down bottom originally was called the doomsday cannon. What was the weapon on the top, was it a normal battle cannon? If so, then what I've lost in firepower with the doomsday mortar, I've probably made up with this turret... Double barrelled means it's twin linked too. a few greebles to break up the flatness. Amazing progress mate. And considering the size of it, why not sell it off as a Capitol Imperialis? Or christen it as a class on it's a-own? Not that there's anything wrong in labeling it a Leviathan or anything, just wondering. Well, and wether you're slowly bringing us up to speed with a photo history or if you have a sweat shop in your basement, it's a cool and impressive build nontheless. Am I going to have to go look up my AC/DC back catalogue now?? This is some work on the back I did. Which one? I figure that several (or perhaps even all of them) are appropriate to some degree. My favourite WIP shot, even now 4 weeks later!